Miami-Dade County (pop. 2,496,435) is Florida’s largest county by population, and the seventh-largest county in the U.S. It’s the most southeasterly county on the U.S. mainland. Dade County was created in 1836 and named for Major Francis L. Dade, a soldier who died in the Second Seminole War in 1835. Voters changed the name to Miami-Dade in 1997. The courthouse was built in 1926. The county seat of Miami-Dade County is the city of Miami (pop. 400,769), second-largest city in Florida (after Jacksonville). The MLB Miami Marlins and NBA Miami Heat play in Miami; the NFL Miami Dolphins play in nearby Miami Gardens. Marlins Park was built on the site of the former Orange Bowl. Metrorail (1984) is a rapid-transit system with two lines, covering 24 miles and connecting downtown with the airport and suburban areas. Downtown also has a free, 4-mile people mover. Actor-comedian Jackie Gleason (1916-1987) lived and worked in the Miami area for many years. He is buried at Our Lady of Mercy Cemetery in Miami, with the inscription “And away we go” on the tomb. The separate city of Miami Beach (pop. 87,779) is on barrier islands, across Biscayne Bay from Miami. 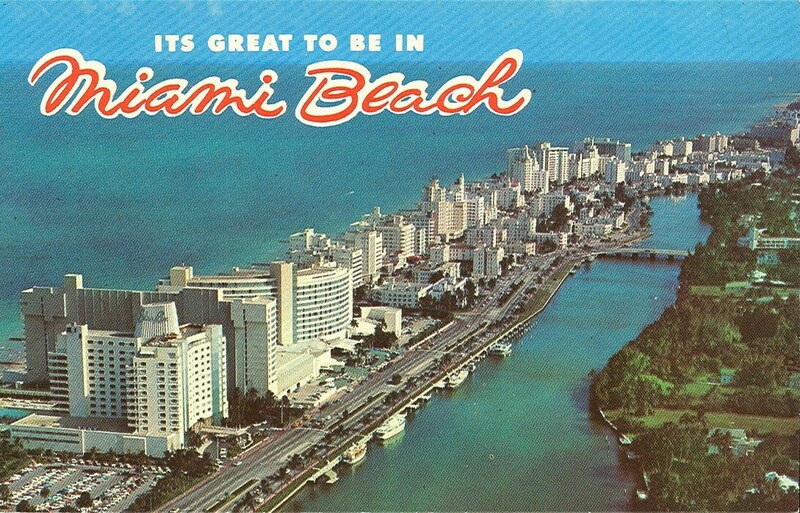 Miami Beach is known for having the most extensive collection of 1920s and ’30s Art Deco architecture in the world. There’s an annual Art Deco Weekend. 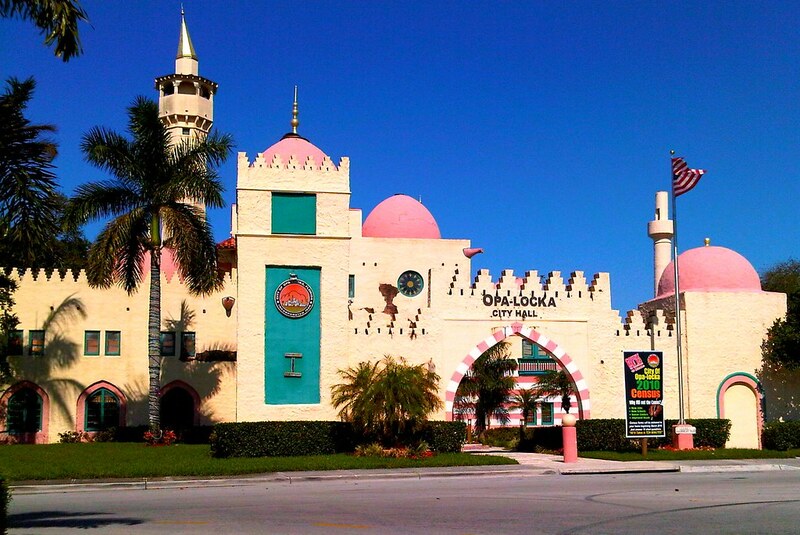 The nearby community of Opa-Locka, established in 1926, has the world’s largest collection of Moorish Revival architecture. The city of Coral Gables (pop. 46,994), home of the University of Miami, is known for its Mediterranean Revival architecture. The headquarters of Burger King is located in an unincorporated area of Miami-Dade County. Everglades National Park is in the western part of Miami-Dade County. 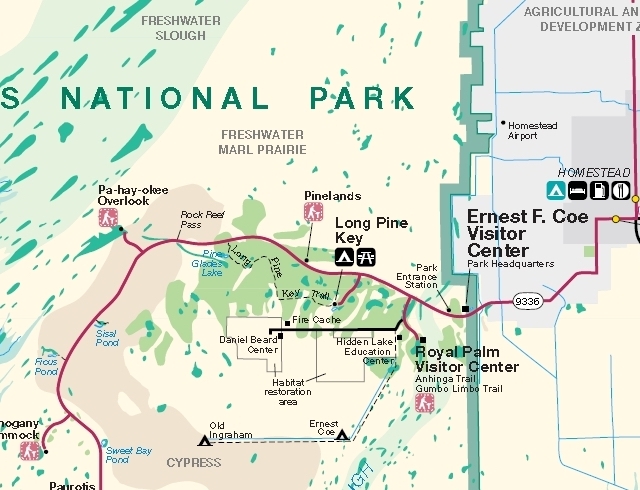 The Ernest Coe Visitor Center is west of the city of Homestead (“Gateway to the Everglades”). This entry was posted in Florida and tagged Biscayne Bay, Burger King, Coral Gables, Everglades, Jackie Gleason, Metrorail, Miami, Miami Beach, Opa-Locka. Jackie Gleason’s tombstone is brilliant! Hate to see unusual and funky Florida end. i think they should have left the name ‘dade county’ alone. oh, and you could have forgotten about Burger King…..sigh.